We recommend checking out our discussion threads on the HP DreamColor LP2480zx Professional LED Backlit GV546A4#ABA, which address similar problems with connecting and setting up Computer Monitors HP. The user manual for the HP DreamColor LP2480zx Professional LED Backlit GV546A4#ABA provides necessary instructions for the proper use of the product Computers & Solutions - Monitors & Displays - Computer Monitors. The DreamColor LP2480zx Professional LED Backlit 24" IPS LCD Monitor from HP features a 24-inch viewable image area along with a native resolution of 1920 x 1200, a 6 ms gray to gray response time, and a 1,000:1 contrast ratio. This display utilizes IPS technology, providing enhanced 178° horizontal and vertical viewing angles. Additionally, the display supports a maximum brightness of 250 cd/m², and a minimum brightness of 50 cd/m². This color-critical display comes complete with 100% Adobe RGB and sRGB color coverage and supports over 1 billion colors. You also benefit from an enhanced look up table with 12 bits per entry and support for up to 1,024 entries per table. This HP DreamColor display supports a variety of OSD functions to simplify the process of adjusting the display settings. Supported OSD functions include color space, luminance, whitepoint, primaries and gamma information, reset to factory calibration, reset to last calibration, black level, overdrive, custom scaling, PIP controls, language, power saver, power on recall, bezel button LED, auto EDID update, and much more. 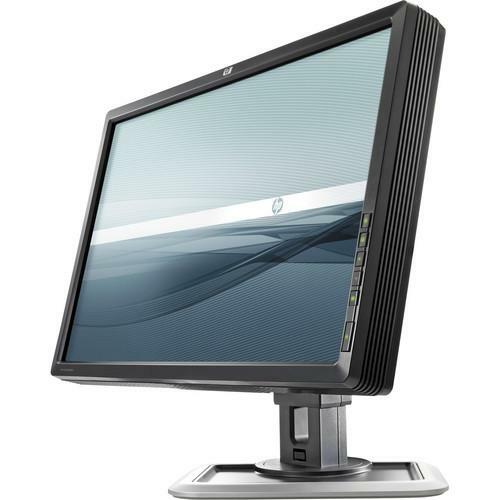 Setup and configuration of this HP DreamColor display has also been simplified as it supports a variety of connections including DVI-I, DisplayPort 1.1, HDMI 1.3, component, S-video, and composite inputs. Once configured, the monitor can be swiveled, tilted, pivoted, and raised or lowered to provide enhanced viewing comfort. Please note: It is not possible to perform DreamColor color management on this monitor with a YCBCR (YUV) input signal. To perform DreamColor color management with a YCBCR input signal, the signal must be converted to a digital RGB signal using separate hardware such as an SDI converter. If you own a HP computer monitors and have a user manual in electronic form, you can upload it to this website using the link on the right side of the screen. Box Dimensions (LxWxH) 22.2 x 20.7 x 10.0"
The user manual for the HP DreamColor LP2480zx Professional LED Backlit GV546A4#ABA can be downloaded in .pdf format if it did not come with your new computer monitors, although the seller is required to supply one. It is also quite common that customers throw out the user manual with the box, or put the CD away somewhere and then can’t find it. That’s why we and other HP users keep a unique electronic library for HP computer monitorss, where you can use our link to download the user manual for the HP DreamColor LP2480zx Professional LED Backlit GV546A4#ABA. The user manual lists all of the functions of the HP DreamColor LP2480zx Professional LED Backlit GV546A4#ABA, all the basic and advanced features and tells you how to use the computer monitors. The manual also provides troubleshooting for common problems. Even greater detail is provided by the service manual, which is not typically shipped with the product, but which can often be downloaded from HP service. If you want to help expand our database, you can upload a link to this website to download a user manual or service manual, ideally in .pdf format. These pages are created by you – users of the HP DreamColor LP2480zx Professional LED Backlit GV546A4#ABA. User manuals are also available on the HP website under Computers & Solutions - Monitors & Displays - Computer Monitors.